Here's one of the superb new slots online game from Microgaming. This game has a 5 x 3 Reel System, and 20 pay lines. With a minimum bet of £0.20 and a maximum of £20, it is easy enough on the wallet. 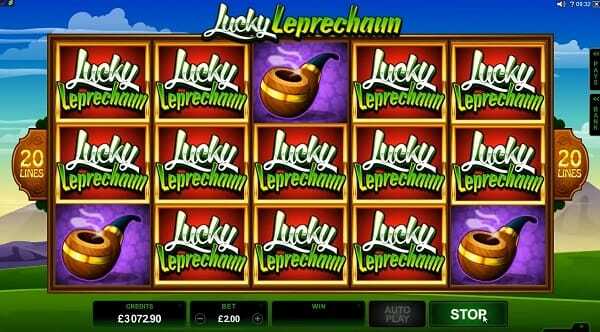 An Irish-themed slot game, Lucky Leprechaun has more than just alliteration working for it. Microgaming borrows the most infamous character from Irish folklore to give this online casino game a whimsical feel. Check out our entire list of slots games here at SlotsBaby. Keeping true to its name ensures luck comes your way with its various bonuses and features. It’s almost like each bonus has a mini-bonus within it. Free Spins are accompanied with little Shamrocks for more prizes; while the Bonus Round presents you with little rainbow bridges, leading you closer to the Pot of Gold. If you love promos, visit Slotsbaby today. Centred around the idea of Luck and Leprechaun – who is essentially a type of fairy reputed for mischief, and is associated with Pots of Gold and Rainbows – Lucky Leprechaun conforms to these perceptions fully. The Leprechaun is clad in a green suit, a green top hat with a buckle, and striped socks. His look is further solidified with an ever so cheeky and toothy grin. The slot game opens directly to the screen with the Leprechaun greeting you in a distinct Irish accent. He wishes you luck and tells you to watch out for his pot of gold, and ends his introduction with a mischievous laugh­ that you can’t help grinning along to. – it’s almost devoid of quaint and subtle touches. The game board occupies most of the screen space with the background functioning as a mere border. It is evident that the developer prefers the player’s attention to be fully on the slots, and not elsewhere. Even the background music, is just that – background. It definitely has an Irish touch but its also melodious and easy, blending into the game. The reels, however, are very vivid and eye-catching. The symbols are spirited with their vibrant colours. The playing card symbols – which are the low paying symbols – are not just big and bolded, they are also engraved in a Celtic fashion. These symbols are 10, Jack, Queen, King, and Ace. Livings up to its name, this slot game works hard to ensure you get lucky! Lucky Leprechaun slot not only has a Wild Symbol and a Scatter for Free Spins, it has additional symbols within the Free Spins to secure you more Free Spins and Points. On top of that, it also has a Bonus symbol that leads to the Bonus Round: Trail O Fortune. Below is an elaboration of what they do, and how they work. The Lucky Leprechaun game logo is the Wild symbol for this online slot game. Like all Wilds, the Lucky Leprechaun can substitute all symbols with the exception of the Scatter (Four-Leaf Clover) and the Bonus symbol (Pot of Gold). Interestingly, the Wild can also function as a symbol of its own, forming winning combinations with other Lucky Leprechaun logos – not having to transform or take the place of different symbols. The Four-Leaf Clover represents the Scatter symbol in this online slot. It only appears on the 5th reel, so keep your eyes glued to lucky number 5! All you need is just 1 Four-Leaf Clover and it will trigger the Free Spins round. You will receive 5 Free Spins in total, and your winnings will get multiplied by 2 for those 5 rounds. Additional features during the Free Spins round are the Gold and Green Shamrocks. They will attach themselves to low paying symbols, either gifting you more spins or additional multipliers depending on the Shamrock. The Pot of Gold represents the Bonus symbol. You have to get 3 or more of them in any position of the reel to enter the Bonus Round: Trail O’ Fortune. It is definitely a neat little diversion from the reels in the base game. The page is dominated by a giant swirl which starts from the ground and spirals up towards the sky. At the end of the giant swirl sits a Big Pot of Gold, adorned with the arc of a rainbow. The concept is similar to that of the evergreen children’s game: Snakes and Ladders. Expect for grids, we have got a trail; and instead of ladders, there are rainbows – and, of course, rather than tossing a dice, you spin the Wheel O Fortune. Depending on the number you receive on the wheel, you move up the trail. If you land on a rainbow bridge you get to cross it, getting that much closer to the celestial Pot of Gold. All in all, Lucky Leprechaun is a medium-variance online slot game which is simple enough to play. The Irish theme is a nice touch, and the graphics are not too schmancy but are attractive enough. The bonus round (Trail O Fortune) is a lovely addition to the online slot game. It adds both suspense and heightens anticipation; while the additional features within the Free Spins make for lucrative winnings. It is a good effort and if you are persistent enough, you may just end up with some serious dough. We would wish you all the best but the Lucky Leprechaun does it much better: ‘Best o’luck to ye, and watch out for me pot o’gold!’ If you enjoyed Lucky Leprechaun then you might also like Immortal Romance.